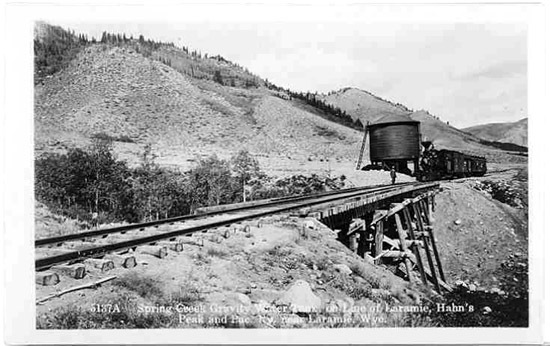 Laramie, Hahn's Peak and Pacific Railroad -- wyoming Tales and Trails. This page: The Laramie, Hahn's Peak & Pacific Railroad, Isaac Van Horn continued from previous page. Grading for the Lamamie, Hahn's Peak and Pacific Railroad west of Fox Park, Wyo. Isaac Van Horn, the man behind the L.H.P. & P. had made his initial money as a grocer in Nebraska before moving to Boston. Van Horn in his capacity as an investment banker recommended the sale of the railroad's bonds as a "most conservative 6% investment." Securities and Exchange Commission Reports, Vol. 116, p. 352 (1921) reflect that Van Horn recieved from the railroad $2,750,000 in stock "without detailed information to show that any property was received" from Van Horn. 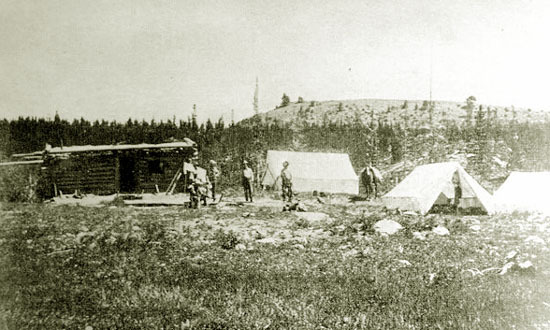 Surveying Party for the Lamamie, Hahn's Peak and Pacific Railroad, 1901. Beginning about 1905, one James C. Riach began the employment of dummy entrymen for the aquisition of coal lands in the North Park area of Jackson County, Colorado near Coalmont. Miller with several others also began the aquisition of coal lands. The use of the dummy entrymen was, of course, in violation of Federal law and was fraudulent. The coal lands were then conveyed to the Van Horn and Miller's Northern Colorado Coal Co.. Coal without railroad transportation is of value for only local sale. 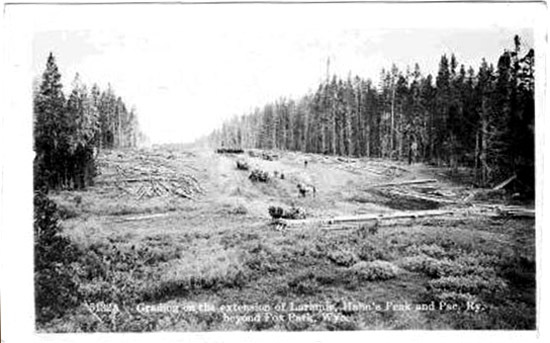 Laying rail for the L. H. P. & P.
In Laramie, Acme Consolidated acquired a number of city lots and an office building. 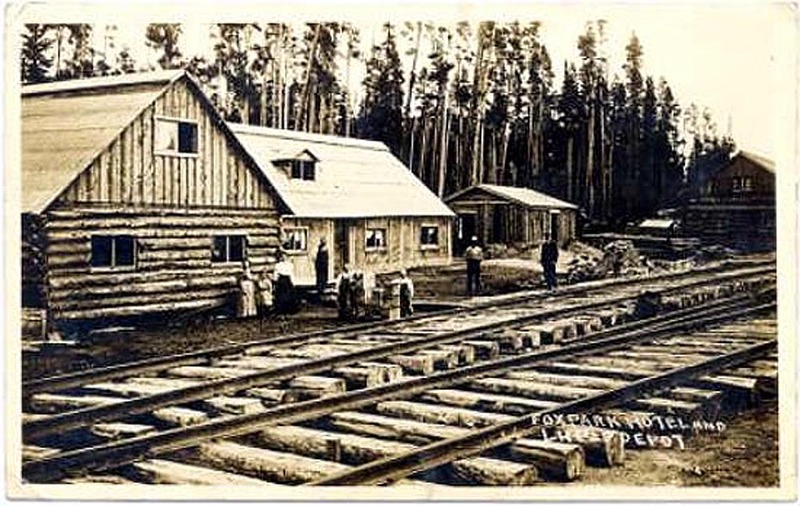 At Centennial, the company aquired in addition to the townsite, 100,000,000 feet of standing timber, a sawmill, planing-mill and lumber yard, and the Centennial Post newspaper. The "Rocky Mountain Country Club" was to be located on a 320 acre site. The Club was to feature, among other amenities, polo grounds. Col. Van Horn (he was an aide de camp to the Governor Henry B. Quinby of New Hampshire with the title of "Colonel. "), belonged to two country clubs in New England. Gravity Water Tank, L. H. P. & P. Railroad, Spring Creek. Raising money to construct the railroad was slow. 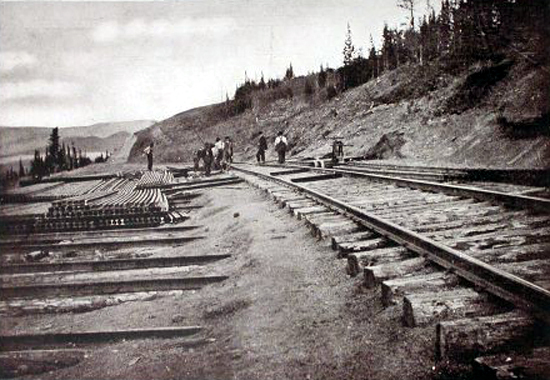 After three years, the railroad had laid only seven miles of track. In December, 1906, Col. Van Horn announced that soon there would be "startling news." By then, the stock in the railroad was selling for forty cents a share. In Febrary 1907, Col. Van Horn predicted that the entire line would be completed within 18 months. Actually, it took four more years to reach the Company's coal mines and never reach its proposed ultimate destination. However, in 1907, the railroad finally reached Centennial. The slowness of construction perhaps gives a different meaning to the local joke that L.H.P.& P. as standing for "LOng Hard Pull and Perhaps." In Centennial, as described by Professor Larson, the railroad "paused." After pausing, the railroad reset its course for Walden and Coalmont. By 1910 it finally reached the state line. By that time, however, mail addressed to the gold mining company in Laramie was being returned as undeliveable. By 191l, the Railroad had reached the Coal Company's mine at Coalmont. The rolling stock for the railroad was minimal. It had three locomotives,18 cars and one rotary plow. Rotary Plow, L. H. P. & P. Rairoad. Unfortunately, by 1911, the bloom was off the mining boom in the Medicine Bows and Centennial. Other difficulties lay on the horizon. An action was brought by the Federal Government against the coal company to set aside the patents issued for the coal lands. The patents were set aside by the United States District Court. The ruling was sustained on appeal. See Northern Colorado Coal Co. v. Unted States, 234 F. 34 (8th Cir. 1916). The Companies went into receivership. In 1913, Col. Van Horn filed for personal bankruptcy. The bankruptcy schedules showed that he had liabilities exceeding $778,000 and assets of $100.00. 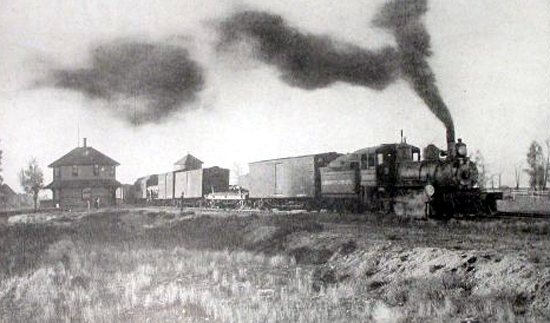 In 1914, the railroad was sold in a foreclosure sale and later sold to the Colorado, Wyoming & Eastern Railway Company. Subsequently it was sold to the Union Pacific. 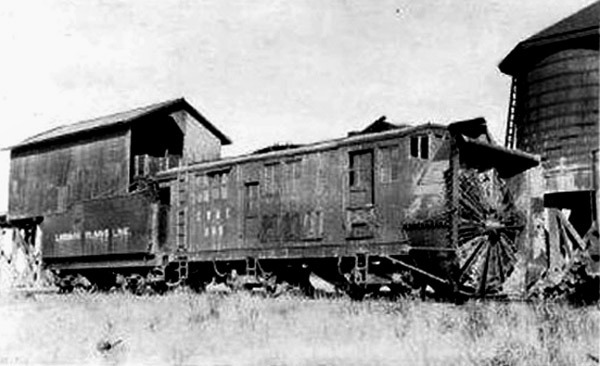 The line is now abandoned and the rolling stock sold to a railroad in Arizona. L.H.P.& P. depot and hotel in Fox Park, Wyo. With the failure of the railroad and mining companies, Col. Van Horn moved to Florida. By 1922, he had established an oil company to drill for oil in the Green Swamp of Polk County, Florida. On the edge of the swamp and on the shores of Lake Agnes and Mud Lake he established a new town named "Polk City." The town, at an elevation of 173 feet, was promoted as being in the "Scenic Highlands" of Florida. After seven years of searching for oil without success, Col. Van Horn pulled his drilling rigs out of the swamp. In the Florida Boom of the 1920's many great cities arose. Polk City was not one of them. By 1960, its population had descended from a peak of 600 to 203. With the growth in the Central Florida corridor, the town has begun to come back and now has a population of about 2,000. Laramie Depot, L. H. P. & P.
Hope that there is gold in them thar hills springs eternal. In December of 2000, the Wyoming State Geological Survey announced that a sample rock had been found at Centennial Ridge that was "highly anomolous in gold," leading to the possibility that the gold vein may yet be found. 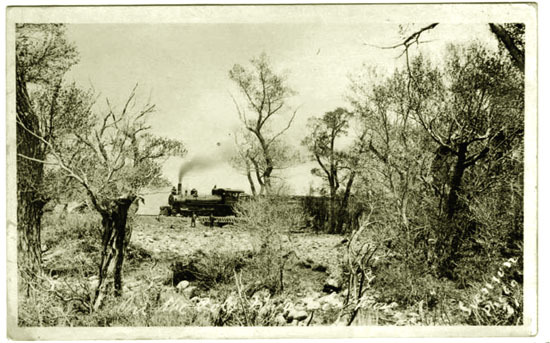 L. H. P. & P. locomotive, undated. Photo by Henning Svenson. Tains of the L.H. P. & P.
That they'd no further go. As quoted by Frank R. Hollewback: "Laramie Plains Line," Sage Books Denver, 1960. Background music this page: Rattlin Cannonball as sung by Montana Slim. Next Page Centennial Ridge continued, Douglas Creek and Keystone Mining Districts.